More people are now surfing the web on the go – via smartphones, tablets, and laptops. If you want a piece of this traffic, you need to make your website's design responsive to all mobile devices. To give your visitors an enjoyable mobile experience, make sure your website design fits the screen of any device. Additionally, all elements of your website – pages, resources, actions, and so on – should be easily accessible. If not, visitors will get frustrated and click away to a competitor. And who can blame them? You’d probably do the same. This means displaying your phone number in the upper-right corner of every page and providing a simple, easy-to-find contact form. While some people prefer not to give up their email address for fear it will be picked off by spambots, it can serve as another contact option for those who hate web forms. Ideally, you will provide more than one way for your customers to contact you. Give your visitors a choice, make it easy, and they will come. Have you started to notice a theme here? Proper web design can be summed up in one word: easy. People are always busy. They don’t have time to navigate a complicated website, dig through dozens of pages to find a contact number, or try and figure out what it is that you’re selling because your mobile site doesn’t display content properly. So when it comes to design, simplicity makes sense. When producing a simple website, every page, word, and image you create must have a singular purpose: to get visitors to contact you. Don’t waste time distracting them with excessive information, silly games, or flashy animations. Instead, have a nice clean layout so they can understand what you’re offering quickly and can contact you with a click. Say you have to choose between two different websites. They both sell the same thing and look virtually the same. The key difference is that one uses real photos of the owner and his or her staff, while the other uses generic stock images of business people. Assuming images from both sites are of the same quality, which one will you more likely choose? Undoubtedly, the one that looks the most authentic. So next time you have to choose between stock images and shooting photos of you and your staff, invest some time and money in quality pictures taken at a studio – it’ll be worth every penny. Everyone loves throwing social media icons on their websites, and it’s not a bad idea to show your credibility. However, if you put these at the top of the page, your visitor is more likely to click on them immediately. Sounds cool, right? Wrong. When this happens, you just created an exit for them to leave your site and never return – and we all know how easy it is to get distracted on social media. Instead, place your social media icons at the bottom of the page or in the footer area. Remember the goal of your website is to convert. If your visitors leave before they get a chance to explore your services, content, and offerings, you’ve lost them before you even had them. Need a website or another solution to enhance your digital presence? 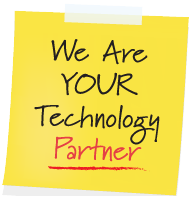 Give us a call and leverage our IT expertise for your business.